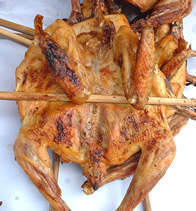 Laos has a wide range of food, ranging from European to Asian cuisine. But whenever you visit Laos please do not forget to try 'khao neo' (sticky rice). Khao neo is a symbol of Laos and it is taken together with all sort of food (like Europeans eat bread). Khao neo can also be used to make desert. So don't forget to try Lao khao neo. Laap (meat salad), tam maak houng (papaya salad) and ping kai (bbq chicken) are typical Lao food and eaten with khao neo. Please bare in mind that some of Lao food are quite hot and spicy, so it is a good idea to ask people to make it less spicy if you cannot take hot food. There are a lot of restaurants scattered over the town. You can find Japanese, French, Italian, Chinese, Indian and other kinds of food in those restaurants with their own unique environment. If you like something quick and simple, fer (noodle soup) is the best choice, especially for those who are always up and running. When visiting Laos, don't forget to drink Beer Lao. 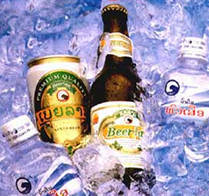 Many people suggest that Beer Lao has a very good taste and can compete with foreign beers. Besides, if you come to Laos during March to May, you can try sugar cane juice (or what we call 'nam oy'). Fresh nam oy can make you up and running quickly in a hot day.